He leaned in and sniffed the lid of the barrel-necked jar, a drawing of tall flowers serving as its label. “It’s black currant,” a woman says, as he nods. Outside of the frame, another man suggests that he take the homemade jam with him––”The kids can give it to Michael as a present,” he says––just as Michael Jackson turns to return the jar where he found it. Michael Jackson had turned slowly, carefully, as if unsure of what to do. His military jacket dwarfed his frame, of the same dancer who would claim the moonwalk as his during the 1983 Grammys, to shrieks of delight. A decade later, Jackson flew to Moscow to become the first pop star to perform in Russia following the Soviet Union’s collapse. The day after the concert, he visited an orphanage for mentally disabled children. He was 35. Moreover, the documentary observes a far more obscure moment in Jackson’s career, especially compared to other posthumous Michael Jackson documentaries: Spike Lee’s Bad 25, which made its television debut this past Thanksgiving, had Questlove and Justin Bieber weighing in on Bad‘s influence, plus scenes delving into the album’s making. This Is It, whose box-office run grossed more than $250 worldwide, was a behind-the-scenes look at Jackson’s comeback tour planned for 2009, before Jackson died at age 50. However, close to 40 of its 55 minutes are not about Jackson specifically, but of the necessary preparations and reactions from Moscow residents themselves. They weigh in on whether it succeeded or failed: Journalists say they idolized the King of Pop, while concert organizers accuse journalists of misleading residents into believing that Jackson wasn’t visiting Moscow, and residents vouch that tickets cost up to one month’s salary. To hear recollections of his visit strung together like folklore is trying. Furthermore, compared to coverage surrounding him at the time, watching Moscow Case 1993 feels like fighting for access. The documentary reuses the same few scenes of Jackson taking a deep breath, like a child about to cannonball off the deep end, before he enters and exits shelter. In one of these scenes, Jackson ducks into a limo past a crowd of anxious fans. “Michael I love you very much, say one word for me please,” one says. The longer I watched, the more I realized that I felt like them, like I was fighting to catch a glimpse of him. What feels even stranger is that, instead of concert footage from the MTV icon who was in Thailand on tour, and with two Pepsi spots airing globally that same year, Moscow Case 1993 offers cartoon stills of how he stood and the crowd responded. But then towards the end, the plot shifts. A concert technician says that the day after the concert, he suggested that Jackson visit the orphanage. Two of these orphans––both of them grown, one now a Special Olympics champion––reminisce of his visit. They say they could barely sleep that night, and they call Jackson to an angel and a saint. You can see for yourself, though, how the King of Pop cradles one child as he strokes the hair of another and his face eases into a smile. You feel touched, but at the same time you count the ways that you have started to recoil––how your hands are to your face, your knees close to your chest, your brow furrowed. 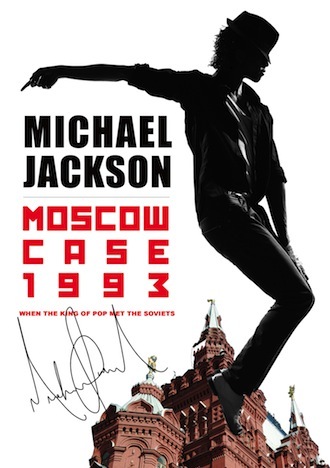 Previously in Moscow Case 1993, Jackson navigated the crowds while wearing a jacket with Peter Pan emblazoned on the back and Captain Hook on the front. In another scene, a fan holds up a hand-drawn poster of Jackson wearing a different jacket, the red leather one from “Thriller,” and with a face darker than the one she likely saw. The documentary does not address how Jackson would come to write “Stranger in Moscow,” of how his visit would inspire him to illustrate the high-profile allegations and investigation as a “sudden and swift fall from grace.” But at the orphanage, you can see how he lined his eyes with kohl powdered his already-pale face a little bit more liberally––how his transformation could have benefited from a steadier hand. HIStory: Past, Present and Future turned out to be a double album, a greatest-hits compilation paired with 15 new recordings that showed how vulnerable he had become. Critics found HIStory hard to swallow at the time, but pop stars have since followed suit by airing out their grievances in song, if not just as publicly. Unfortunately, Jackson would never live to show future pop stars how to truly rebound from all of that. On June 24, 2009, Jackson ran through a six-hour dress rehearsal for his This Is It tour. On June 25, he was found dead. And on Monday, CNN reported of emails showing that concert promoter AEG Live may have hired, supervised, and pressured Jackson’s physician to see that King of Pop ready, despite signs of poor health. In Moscow Case 1993, when he lands, residents could see how Jackson took two feeble steps to exit the plane, as if he was twice his age. When he leaves Moscow, he gets out of his limo, twirls, and then outstretches his arms for a photo. He smiles, perhaps despite knowing where he was heading next, which was deeper into an investigation that would drag on into 1994, when Jackson reportedly paid a civil settlement of up to $20 million. The real point of Moscow Case 1993 may be to see Jackson right before the child sexual abuse allegations wore him down, to where his surefooted past would seem like a century ago. Moscow Case 1993 offers a small, rare glimpse into a quieter moment of his career. It insists that Jackson could not have been guilty of child sexual abuse. It keeps its distance, and it operates much like how the orphanage employees and residents treat the King of Pop. Just as he bends and turns to replace the jar of black currant jam, a boy’s voice chimes in. “Take it, take it, take it, please,” it says.